Researching and reporting. Student utilizes technology to reference the zoology of hyenas. The home of LIMITLESS POTENTIAL, Lutz Learning Center breaks the mold of a traditional education model. The School's programs provide each student with the opportunity to develop socially, emotionally, intellectually and physically at a pace appropriate for each individual. The Center is designed specifically for children and their enrichment. Children are encouraged to examine, explore, and discover. Perceptual and motor developments are promoted by exposure and practiced use of specific materials and equipment. Students are given the opportunity to make choices yet learn to function with a degree of structure. Individual development is continuously assessed to ensure each child is provided a challenging and successful experience and is developing appropriately. Project based learning at its finest! Rough drafts and final drafts. 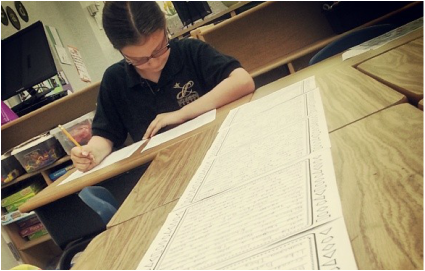 Students honing their writing skills prepare to turn in final drafts of an assignment. Encouraging leadership in the classroom. ​Additional programs are available beyond the 8:30-2:15pm school day.